THE MOST ADVANCED BRAIN SUPPLEMENT! New FOCUS FREAK™ is a clinically backed cognitive function/nootropic supplement formulated to deliver laser-sharp focus, mental energy and stress reduction. FOCUS FREAK’s cutting-edge formula features the patented ingredient ZEMBRIN®, which is clinically proven to enhance concentration and mood while reducing stress. FOCUS FREAK™ works fast! In fact, it will start working right after your very first dose! FOCUS FREAK™ contains patent-protected and clinically proven ZEMBRIN® and other key ingredients to deliver enhanced focus and cognitive function through 3 key mechanisms: 1) Inhibits phosphodiesterase-4 (PDE). 2) Creates a Neuroprotective effect on the brain for greater cognitive function. 3) Improves the mind & body’s ability to tolerate stress. ZEMBRIN® is an exclusive and proprietary selection of Sceletium tortuosum from South Africa. The unique selection of the South African plant is rich in mesembrenone and low in mesembrine and has been developed into a clinically proven and proprietary extract that improves cognitive function and mood enhancement. 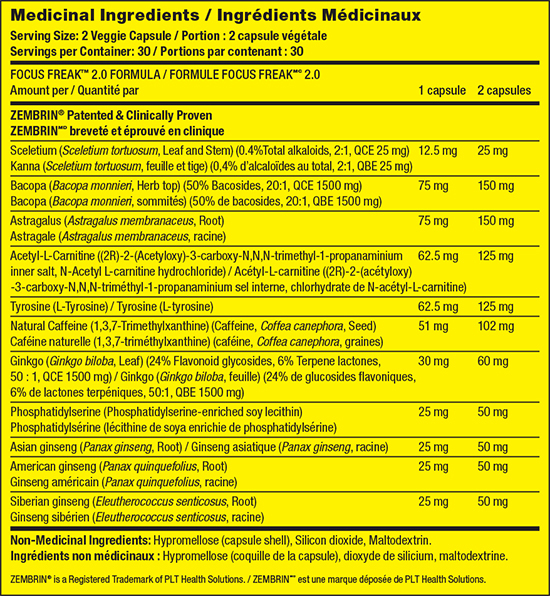 ZEMBRIN® has been demonstrated to improve cognitive function by selectively inhibiting phosphodiesterase-4 (PDE), the enzyme that breaks down the secondary messenger, cyclic adenosine monophosphate (cAMP), in the brain. Higher levels of cAMP in the brain result in improved cognitive function. FOCUS FREAK™ inhibits phosphodiesterase-4 (PDE), the enzyme that breaks down the secondary messenger, cyclic adenosine monophosphate (cAMP), in the brain. Higher levels of cAMP in the brain result in improved cognitive function and focus. 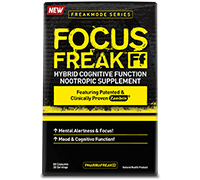 FOCUS FREAK™ contains Bacopa and Ginkgo which have a neuroprotective effect on the brain. It also supplies other key ingredients like Phosphatidylserine, Asian & American Ginseng and Acetyl-L-Carnitine that support improvements in cognitive focus and performance. FOCUS FREAK™ contains Astragalus and Siberian Ginseng to help improve the mind and body’s ability to tolerate stress, which results in improved mental focus and function. (18 years and older): Take 2 capsules, once daily.